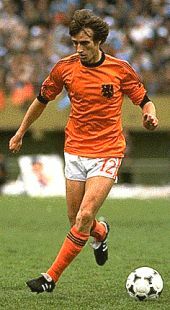 This left-sided attacking player was instrumental as Holland reached two World Cup finals in 1974 and 1978. Born in Amsterdam, Rensenbrink spent most of his career in Belgium with Anderlecht winning several trophies including two European Cup Winners's Cups. He was a good dribbler and like most other Dutch players at that time, he could easily adapt playing in another position if required. He made his international debut for Holland against Scotland in 1968 and by 1974 was established in the team that travelled to West Germany for the World Cup. He missed only one game in the tournament and was only half-fit for the final, but coach Michels gambled and played him from start. He was substituted at half-time in the match Holland lost 2-1 to the hosts. In Argentina four years later, Holland again reached the final. Rensenbrink had more responsibility in Cruyff’s absence. He scored a hat-trick in the opening game against Iran (including two pens) and another penalty against Scotland which was goal number 1000 in World Cup history. 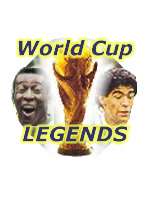 In the final, Holland yet again had to play the hosts and Rensenbrink was an inch away from becoming a World Cup winning hero when his shot at 1-1 hit the post in the dying seconds of the final. Argentina scored twice in extra-time as Holland again had to settle for silver. He played his 46th and last international match in 1979 and in 1980 wound down his career with a spell at Portland Timbers in the NASL, followed by a brief stay with Toulouse in France in 1981.